A high tannin content makes raspberry leaf tea effective for diarrhea, but gentle enough for children. 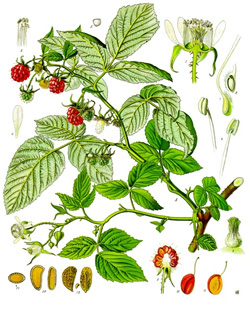 Raspberry relieves cramping and nausea too, and is often recommended for heavy periods. A strong infusion of raspberry leaf tea can be fed at a dose of 2 ounces/per 20 pounds of body weight twice daily or the powdered leaf can be sprinkled onto food 1 teaspoon/20 pounds of body weight. Recipe Instructions: Herbal Tea :Pour 1 cup boiling water over 1 to 2 teaspoons of dried raspberry leaf and infuse in a covered vessel until cool enough to drink. (15 minutes or so). The longer the infusion time, the better extraction of the tannins that make raspberry so effective.